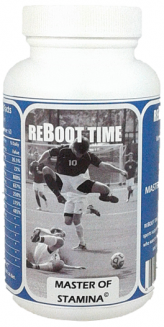 PFLUGERVILLE, Texas - July 23, 2017 - PRLog -- ZLI, Owner of Reboot Time brand of athletic supplements, announces it has introduced Master of Stamina© sports supplement, to take competition athletes such as Soccer over 30, to new frontiers of athletic performance. Every time his team lost a game to a younger soccer team, Zakaria Kouloughli's teammates, all in their 30s and 40s complained of age, stamina, exhaustion, et cetera. Truth is those comments seemed to pop up when a game was lost; in a way to justify the loss; says Kouloughli, CEO of ZLI. Zak, fervent soccer player himself, says even when age is a factor; the players are no telling the whole story; and the reason his teammates lost was because they don't practice. The CEO explains that players cannot expect to perform in soccer competition or in any intense competition when their only workout is: drive their car from home to work and back. "when I used to bring up practice, all I heard was: my boss..., my wife..., my kids...,my work all sort of excuses not to show up for practice." But for those older athletes who want to stay in competition, who don't see their age as an obstacle, always seek out solutions, and see younger athletes as a challenge and an opportunity to excel rather, Master of Stamina© sports supplement can be all they need. This food for the mitchondria DNA, gives athletes the additional energy, that previously did not have, to enable them to compete like young pros. To stay competitive in intense games like soccer over 30, athletes must practice and develop their skills. And when they feel stamina is lacking, do what Chuck Cash did, give Master of Stamina© a shot. Master of Stamina© is sold online only. The sports supplement comes in a 120 capsules bottle, a supply for 60 days.